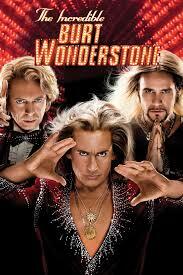 The musical numbers are great, but the story gets tiring and drags on slowly, getting worse and worse as it goes on. The broadway music version of this story, which the movie is based on, knew how to do it right. it knew that the songs were everything and that you needed to get the most out of those songs as possible. the movie doesn’t seem to realize that. once again, the songs and performances are the best part of the entire thing, but here in the movie, the songs are often cut short or set to montages, instead of giving us the chance to watch the characters perform them. still, these are hardly the biggest problems with the movie. the biggest problems have to do with the story which drags on and on. in the first half, we hardly notice. everything is on the up and up, and the movie holds our attention. it’s the second half, where everything falls apart with it’s depressing ideas and slow pace. Jersey Boys is the movie version of one of the best Broadway musicals of all time. And yet the film is utterly disappointing. Chalk that up to songs that feel rushed and a story that seems to drag on and on. Clint Eastwood is the director here, and it really seems like most of his movies from the last decade have been more slow and dull than they have been interesting. I was excited to hear that he was taking on this movie (really just excited to hear that the movie was being made at all), but eastwood was the wrong guy to make it. the movie Opens in a barbershop with christopher walken playing a local gangster who is getting a shave. walken doesn’t have a huge role in the movie, but he’s there in that opening scene to start the movie off with a familiar face. walken really admires this kid frankie, who’s hanging out at the shop and has got a beautiful voice. walken likes frankie so much that he asks the kid (who does not work there), to give him a shave. that’s when tommy, the hot head, walks in and bursts through the door. he comes in so fast that frankie nicks walken with the razor blade. all of this is just to introduce the characters and show that tommy is a bit of a fire cracker. we stay with frankie as he has dinner with his parents at home. tommy shows up at the house to get frankie to go out, and the two of them go off to commit a crime. they decide to steal a safe. frankie is the getaway driver. when the safe doesn’t fit in the trunk, he drives off anyway, with the thing weighing the entire car down in the back, causing the hood of the car to pop up into the air. this leads to frankie driving through a store and the bunch of them getting caught by the police. only tommy goes away for it, though. that will be a common theme here in the early part of the film. frankie being let go by the police because he is the innocent looking one of the group. while tommy is in jail, frankie starts hanging out with the other member of their group, (the three lovers,) nicky. one night nicky takes frankie along with him and his date and they break into a church. that’s because nicky wants to impress his girl with how great frankie can sing, and the church has the best acoustics to show off the kid’s voice. this leads to nicky getting busted by the police. once again, frankie is let off scott free. while nicky is going into jail, tommy is coming out. this is how the first third or so of the movie goes. it’s not really about the music, but at least it’s interesting. the guys are clearly a bunch of goofs, doing the stupidest things without realizing what the consequences will be. either that or they just don’t care. it isn’t until joe pesci (not the actor, but a guy playing the actor, when he was a kid), shows up and introduces them to a man named bob gaudio, that the real music starts to come out. gaudio writes the songs for the group and then one day, he and frankie sneak into a studio office where they sent a bunch of demos. they go from door to door and keep getting rejected until one producer recognizes them from the old neighborhood and brings them in. the boys get hired by this producer who recognizes them from the past. what they don’t realize, however, is that the deal says that they are to be back-up singers until they make it with something big. and they aren’t given the chance to record something that might go big, because the studio and equiptment cost a lot of money to rent out. so tommy keeps borrowing money from loan sharks. once tommy gets enough to buy them recording time in a studio, the boys get what they’re after. now the real music part of the movie starts, and it’s fantastic. just like in the broadway show, we suddenly get hit after hit. from cherry baby to big girls don’t cry to walk like a man. the music is terrific. the only problem is that the songs all come at the same time, and they all seem to be too fast. in the broadway show, each song was played to it’s entirety and on top of that, you had the actors singing and performing them right in front of us. here, in the movie, many of these songs are reserved for background filler as the characters keep acting out the rest of the story, or as a montage of events plays out. considering that these songs are the best thing about the movie, they really should have been spread out better and used front and center instead of as background noise. all that being said, the songs truly are the best thing in the movie, and once they stop, the film immediately goes downhill. that would be the second half of the movie, which kind of sabotages everything this film had going for it (similar to what happened with the second half of into the woods, another film based on a popular broadway musical.) 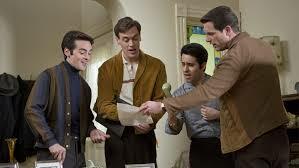 here, in jersey boys, the second half ot the movie is about the decline of the group. tommmy has been borrowing money left and right over the years and never paying it back, and now it finally catches up with them. the group splits up due to everyone having problems with everyone else, and that’s when we start to get into frankie’s personal problems at home. he is having issues with both his wife and oldest daughter. frankie’s daughter becomes a forced storyline that we have heard nothing about throughtout the film, and now suddenly the character is just shoved in our face, taking up ample screen time to deal with her depression. it definitely feels forced, and while it’s understandable that frankie spending time with the girl might be a new stage of his life, what doesn’t help this subplot is how utterly depressing it is. jersey boys works much better in it’s first half than in it’s second. that might be becuase the first half is all of the up and up positive and the second half is where things really start to fall apart. it gets incredibly depressing with everything that happens to frankie’s duaghter, and the musical numbers are not used nearly enough. take the great song, “oh, what a night,” for example. Now this is arguably one of their better songs, and yet the movie saves it for the end credits sequence. the song should have come up way earlier in the film than that. they could have even played it again in the end credits. but by the time it finally does come on, it’s too late. the movie has already lost us and our attention long ago. jersey boys, the movie, suffers from a lack of stategy and a series of bad decisions.